Hey there! Hope everyone had a wonderful past couple of weekends and past week, and I hope all the moms of all kinds out there had perfect Mother's Days. I had a fantastic time at both Mysterious Galaxy bookstores and all over the rest of SoCal! It was great seeing so many of the Alien Collective these past days. But, I'm back home and much went on while I was gone, so let's get all caught up, shall we? We shall! First up, and speaking of the Alien Collective, the last stop on the Alien Collective Blog Tour is large and in charge. Head over to Word of the Nerd for your last chance to enter to win your choice of one of the first 8 books in the series (Touched through Research), signed and personalized. Open internationally. And don't forget about the other stops that have come before! Most have interviews and/or reviews and all have chances to win. And all are open internationally. So if you've missed a stop that's still open, rectify! Speaking of rectification, here's a special prize available, at every stop on the Tour but it's for my Hook Me Up! Subscribers only. Not on? Perhaps now's the time to rectify that mistake. Send an email to gini@ginikoch.com with "Hook Me Up!" in the subject line and you'll be in and sent the special instructions! Once you've entered to win, see what Word of the Nerd though of Alien Collective. Then see what Bitten by Books, A Buckeye Girl Reads, and Bring on the Books thought of it as well! Then see who Larissa's Bookish Life chose as her favorite fictional mothers. And check out T.L. Smith's article at Slice of SciFi where she asks 5 friends what they'd take to colonize a new world -- and since those friends include moi, L.E. Modesitt, Jr., Weston Ochse, Bruce Davis, and Ben Bova, you know you want to check it out! Phoenix Comicon is just around the corner, and you NEED to make plans to be there. Why? In addition to seeing the me and other amazing authors, there are some seriously cool media folks that will be there as well, including Nathan Fillion, Stephen Amell, Cary Elwes, Bruce Campbell, Stan Lee, and Danny Glover...and TONS more! Be here June 5-8, 2014 and have the time of your pop cultural life! Remember that the Brenda Novak auction is still going on through the rest of the month Check out my fantastic Alien Pack -- and bid early and often! I've also been announced as an Author Guest at CopperCon Fantasm, August 22-24, 2014, at the Hilton Garden Inn, Avondale, AZ. Make your plans to come to a fun, intimate con with a ton of great authors and fans! That's it for today, but as always, more's on the way. So let's be winning, con-going readers out there. Peace out, my li'l gangstas, and I'll catch you on the flip side! Happy Friday! Well, it's been a busy week, hasn't it? Hope that all y'all had a wonderful week, both in the blogosphere and elsewhere, and that you all have fantastic weekends planned. But before we get there, we have another stop on the Alien Collective Blog Tour! Head over to Pearls Cast Before a McPig where you can find the latest interview with moi (and, amazingly enough, everyone asked different questions, so if you want an insight into my, and Kitty's, process, check out all the stops along the way! 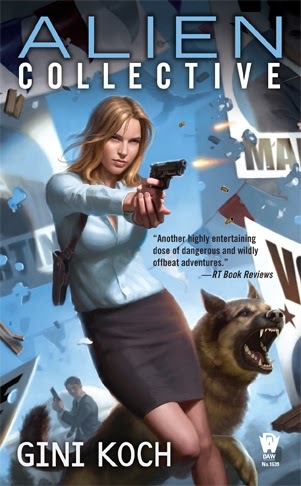 ), Sullivan McPig's review of Alien Collective, and another chance to win a signed, personalized copy of your choice of Books 1-8 in the Alien series. Open internationally, ends May 25. Next up, check out what Gizmo's Reviews thought of Alien Collective. Now it's time to remind you that I'll be in SoCal for the next stops on my mini book tour. So, if you're in or around San Diego come see the me and get your signed copies of Alien Collective and all the other bookie wookies at Mysterious Galaxy San Diego, on Saturday, May 10, from 10am-5pm, I'll be speaking and signing from 1-2pm, but will be around all day. Your other option is in the South Bay, where you can come see the me at Mysterious Galaxy Redondo Beach, from 7:30-8:30pm on Monday, May 12. A good time shall be had by all at each location, so don't miss out! I'll be relatively quiet next week (don't faint) because of being in SoCal and working on Universal Alien and other things of a writerly and deadliney nature. Therefore, I'm giving you more reminders now. Because that's just the nice kind of girl I am. The May issue of Penumbra eMagazine is out and you want it, so you, too, can read the first Alien Series short available, "Alien on the Runway". The other stories in this issue are da bomb, as well. And, if you want to keep up and get the rest of the Alien series shorts I'll have in Penumbra later this year, get a subscription! If you use 2014Gini when you order, you'll get the subscription for half price AND get the Best Of issues for 2012 and 2013, too! Offer ends August 1, and the May issue is available right now, so don't wait, get your deal, and your monthly great reading, going today! Have you checked out and bid on the many excellent offerings at the Brenda Novak auction? Check out my fantastic Alien Pack -- and bid early and often! 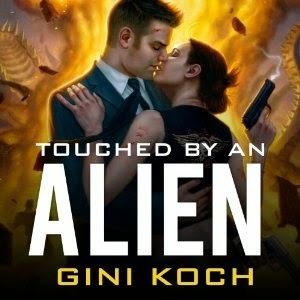 Last but in no way least, Touched by an Alien is out in audiobook form. If you haven't scored your copy yet, now's a great time. They do make lovely Mother's Day gifts. ;-D Get your copies today, from Audible, Amazon, Tantor Audio, and other fine retailers all over. That's it for this week, but as always, more's on the way. So, enjoy the slide into the weekend, see some of you in San Diego and others of you in Redondo Beach, and still others of you in other places. Peace out, my li'l gangstas, and I'll catch you on the flip side! Hey there! Have we all been enjoying release week? I have, in part because so many of you are enjoying Alien Collective! But there's more in store, and it's a short but very sweet one today, so let's get to it! First off, head over to I Smell Sheep where they have both a review of Alien Collective and a chance for you to win your choice of one of the first 8 books in the series. Then hit Under the Covers where they have the latest running of my yap and yet another chance to win. I know, it's too happy to be true! There's a special prize available, at this stop as well as at Bibliognome (contest ends May 15); Book Girl of Mur-y-Castell (contest ends May 18); Gizmo's Reviews; A Buckeye Girl Reads (contest ends May 12); and boeklogboek (contest ends May 14) but it's for my Hook Me Up! Subscribers only. Not on? Perhaps now's the time to rectify that mistake. Send an email to gini@ginikoch.com with "Hook Me Up!" in the subject line and you'll be in and sent the special instructions! That's it for today, but, yet again, more's on the way! So, peace out my li'l gangstas, and let's be winning readers out there! But there's more going on than my pre-order public service announcement, yes there is! First up, the next stop on the Alien Collective Blog Tour is live over at boeklogboek. As with the other stops, you can enter to win your choice of any one of the first 8 books in the series (Touched through Research). There's a special prize available, at this stop as well as at Bibliognome (contest ends May 15); Book Girl of Mur-y-Castell (contest ends May 18); Gizmo's Reviews; and A Buckeye Girl Reads (contest ends May 12) but it's for my Hook Me Up! Subscribers only. Not on? Perhaps now's the time to rectify that mistake. Send an email to gini@ginikoch.com with "Hook Me Up!" in the subject line and you'll be in and sent the special instructions! After entering to win, head over to see what Feeling Fictional thought of Alien Collective. Next up, it's more interactiveness from moi! Head over to Weird Romantics and check out my podcast with them where you can hear the dulcet tones of my yap. And More Geek Than Gay has their latest video podcast up now, where you can see the me as well as hear the me. Also, the bidding is going strong at the Brenda Novak auction. Check out my fantastic Alien Pack -- and bid early and often! SoCal, as in San Diego and the South Bay Area, I will be in you! Make your plans to see the me, and get your signed copies of Alien Collective and all the other bookie wookies, at Mysterious Galaxy San Diego, on Saturday, May 10, from 10am-5pm, I'll be speaking and signing from 1-2pm, but will be around all day; and/or see the me at Mysterious Galaxy Redondo Beach, from 7:30-8:30pm on Monday, May 12. A good time shall be had by all at each location, so don't miss out! That's it for today, but, as always, more's on the way. Seriously, more, more, more. So, how do you like it, my li'l gangstas? Peace out and let's be winning readers of Alien Collective out there! First up, the Alien Collective Blog Tour rolls, and yaps, on! Head on over to Book Girl of Mur-y-Castell for the latest interview and review of Alien Collective along with yet another chance to win a copy of your choice of Books 1-8. Open internationally, ends May 18. There's a special prize available, here as well as at both Bibliognome (contest ends May 15) and Larissa's Bookish Life (contest ends May 6), but it's for my Hook Me Up! Subscribers only. Not on? Perhaps now's the time to rectify that mistake. Send an email to gini@ginikoch.com with "Hook Me Up!" in the subject line and you'll be in and sent the special instructions! Alien Collective releases tomorrow, and so do several other great books from DAW. So check out the DAW Books Review and see what else you should be grabbing at the bookstores tomorrow! Make your plans to see the me, and get your signed copies of Alien Collective and all the other bookie wookies, at Mysterious Galaxy San Diego, on Saturday, May 10, from 10am-5pm, I'll be speaking and signing from 1-2pm, but will be around all day; and/or see the me at Mysterious Galaxy Redondo Beach, from 7:30-8:30pm on Monday, May 12. A good time shall be had by all at each location, so don't miss out! Hey, even the papers are talking about it! Last but not least, I lurched into action and have many new things up at Pinterest so if you want to see some pretty pictures of things like covers, who I see as the characters, and more, check it out! And the website has its latest facelift that includes many little new things here and there, should you wish to peruse and see what you may have missed recently. That's it for today, but there's more -- MUCH more -- on the way for the rest of the week, including more Blog Tour stops, many more interviews, some live and some written, and, of course, more ways to win. And, you know, a little thing like Alien Collective being available. So, peace out, my li'l gangstas, and let's collectively be winning readers out there! Happy Friday! Hope everyone had a wonderful week and that the weekend is full of fun and rest and all that good stuff. The weekend is full of book signing for me, and I hope to see a lot of you at The Poisoned Pen on this Saturday, May 3, from 2-3pm. Prizes, fun, and Alien Collective three days earlier than you can get it anywhere else! So, come see the me and get your bookie wookie before everyone else can! But that's not all that's going on. 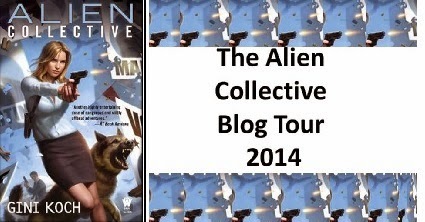 No, indeed, we have the Alien Collective Blog Tour in full swing! 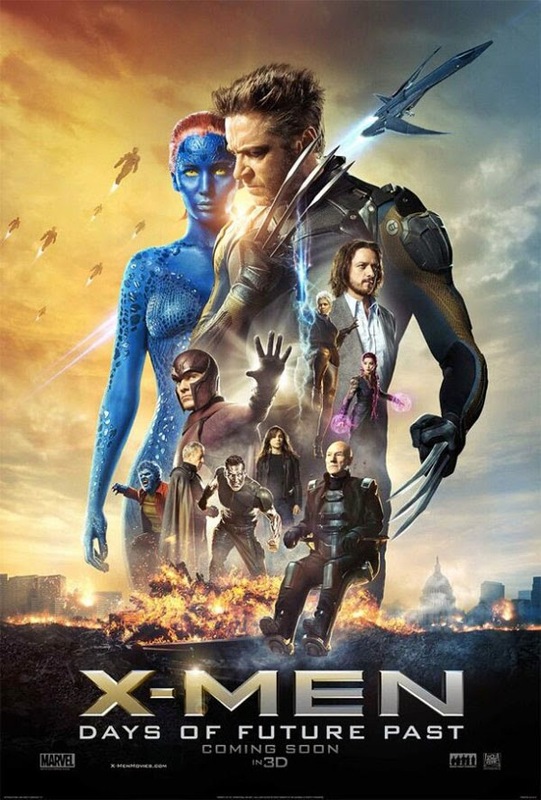 Head over to Bibliognome and see what she thought of Alien Collective. Then, check out her stop on the Alien Collective Blog Tour & Giveaway where there's a little interview with moi AND winning. That's right, you can enter to win your choice of one of any of the first 8 books in the series, signed, personalized, and with accompanying swag. Open internationally. And the same contest is still going on at Larissa's Bookish Life as well, so don't miss out on even more chances to win! There's a special prize, at both Bibliognome and Larissa's Bookish Life, but it's for my Hook Me Up! Subscribers only. Not on? Perhaps now's the time to rectify that mistake. Send an email to gini@ginikoch.com with "Hook Me Up!" in the subject line and you'll be in and sent the special instructions! 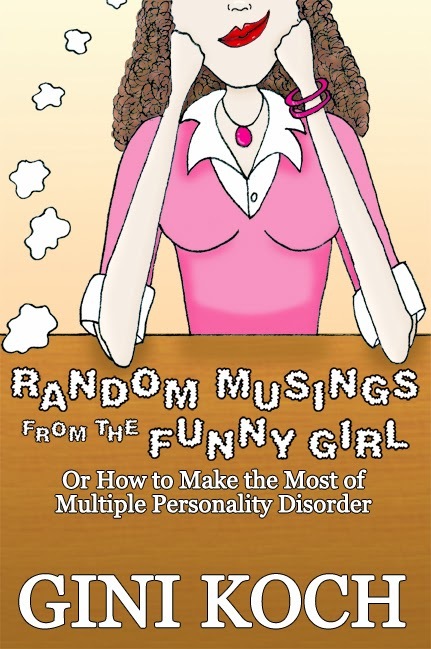 After you've entered to win, check out what Bring on the Books thought of Random Musings from the Funny Girl. But wait, there's more! The May issue of Penumbra eMagazine went on sale yesterday, and within its pages is the first Alien Series short available, aka the story of When Reader Met Gower, aka "Alien on the Runway". Want more reasons to get this issue? Check out the Big News -- complete with, yes, more yapping from moi -- at the Penumbra blog. 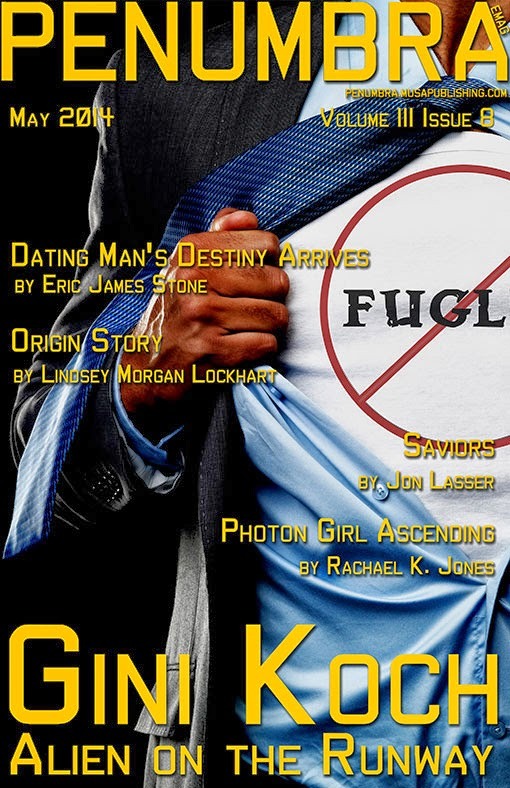 So, have you bought your subscription to Penumbra eMagazine yet? If not, what are you waiting for? I've read this issue and every story in it is great. But that's just a reason to get May's issue, right? BUT, I have two more shorts coming in Penumbra this year. And, sure, you could just buy each issue separately for $3.99 each. Still need a little more convincing? Well, how about this -- there's a special deal going. Right now, you can get The Gini Special -- instead of paying $3.99 an issue, you'll get a year's subscription for just $24.00; that's half price. But there's more! You'll also get the Best of Penumbra 2012 AND 2013. That's a full year's subscription for half price plus two free Best Of collections and three Alien series shorts that will only be available in Penumbra...as long as you use this coupon code (exactly as shown here) when you order: 2014Gini This offer is good only through August 1, 2014, so don't miss out and get your subscription going today! Right now. Hurry up, before the stories get read by everyone other than you. Oh, and lest we forget, the bidding opened up at the Brenda Novak auction yesterday, and will be going on all month. Check out what my offering is -- a fantastic Alien Pack -- and bid early and often! Lest we forget #2 -- Have you gotten Touched by an Alien in audio format yet? Well, if not, join the aural party! Available from Audible, Amazon, Tantor Audio, and other fine retailers all over. Lest we forget #3 -- I'll be in SoCal for the rest of my mini book tour. Saturday, May 10 at Mysterious Galaxy San Diego, party goes from 10am-5pm, I'll be speaking and signing from 1-2pm, but will be around all day. Monday, May 12 at Mysterious Galaxy Redondo Beach, from 7:30-8:30pm. That's it for today but, trust me, more, a lot more, is on the way. So enjoy the downward slide into the weekend, see some of you on Saturday, enjoy "Alien on the Runway" as an appetizer for Alien Collective, and let's be winning readers out there! Peace out, my li'l gangstas, and I'll catch you on the flip side!